More than 60 delegates attended the Second Soil C Science Summit Success in Orange on 14th June, 2007. It was a joint effort by the Central West CMA, the Department for the Environment and Climate Change, and Carbon Farmers of Australia (the trading arm of the Carbon Coalition). Many of the presentations will be posted on the Carbon Coalition blogsite as soon as practicable. Farmers, soil scientists, agronomists, advisers and extension officers came from as far away as Armidale, Gunnedah, Goulburn and the Liverpool Plains to discuss soil carbon and measurement. Staff from four CMA's: Central West, Lachlan, Namoi, and Murray. Representatives from the Country Womens' Association, NSW Landcare and NSW Farmers' Association joined in. 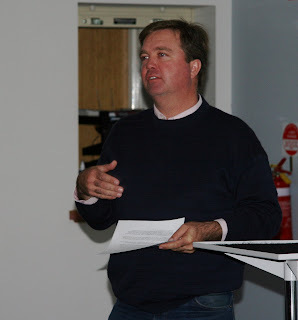 Senior NSW soil scientists like Brian Murphy and Andrew Rawson anchored the day with presentations on soil carbon's simplicity and subtlety. The aim was to put us all on the same page so we can devise a method of measuring sequestration for the purposes of trading soil carbon credits to give farmers the incentive to encourage biodiversity. 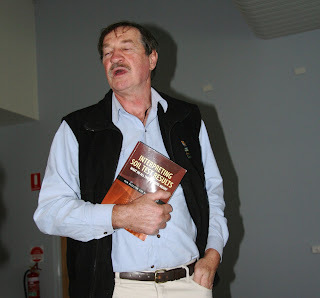 CWCMA Soils Officer John Lawrie introduced Brian Murphy's new book on interpreting test results. (John went into raptures about Brian's useful book.) 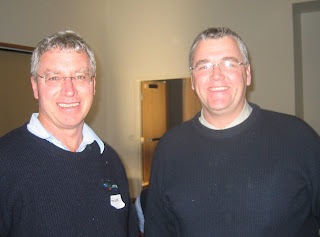 Brian and John were the organising committee for the Summit. The concept of the SUmmit is to expose scientists to practitioners and vice versa so we begin to understand the needs of both groups and the language we use so we can communicate better. Local farmer and winner of the CWCMA FArming Systems Program Michael Inwood delivered a pithy presentation on the farm plan he submitted for the programs. He explained a combination of pasture cropping/advanced sowing and controlled grazing was giving him good results. His plan also calls for his property to start reducing its emissions - in one case, he plans to use an electirc vehicle for all on-farm work, including pulling the low tillage implements. Soils office from the Lachland CMA Ian Packer delivered a lively production on "Quantifying the Obvious" in which he warned he would offend everyone in the room at some stage of his presentation. He made the point that farmers have to be more careful to keep records of paddock history, etc. so results of testing can be interpreted. 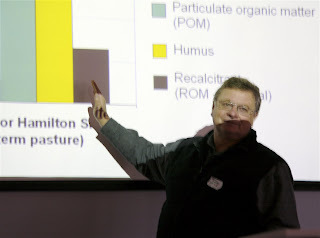 On the left of Ian Packer in this photo is Terence Farrell who gave a comprehensive summation of Conservation Farming Carbon Trading in North America. 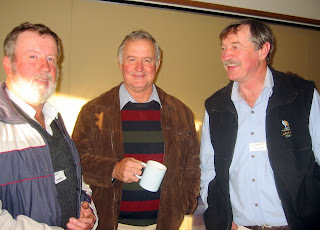 Merriwa conservation farmer Robert Goodear discusses the day's presentations with Namoi CMA's David Walker and CWCMA's John Laurie. I have left the assessment of carbon accounting to scientists but will address the necessity of the recognition of a scheme of carbon trading which will drive the adoption of both more sustainable farming systems and energy sectors within our State. If adopted I believe this will lead to not only more efficient but environmentally beneficial outcomes that will be driven by an exchange which is independent of governments and any lobby that might seek to influence outcomes to their own fiscal advantage. Imperative to this process is a market which gives ample financial reward for better farm production practices and in turn passes these sequestration gains in measurable units through an exchange to emission industries as offsets. The incentive for creating such an exchange is the belief that it will drive the adoption of more environmentally sustainable farming and industry practices. The proposal that I would put forward would recognise improvements in sequestration and conversely emissions by developing a system of quarterly carbon returns with an annual reconciliation return that would enable both farmers and industry to recognise the effect of their practices on carbon and greenhouse gas emissions and by this measurement to improve their techniques. It is proposed that these returns would be submitted to an independently established Carbon Bank which would administer through a clearing house, payments for sequestration units and facilitate trade with emitters for their offsets. 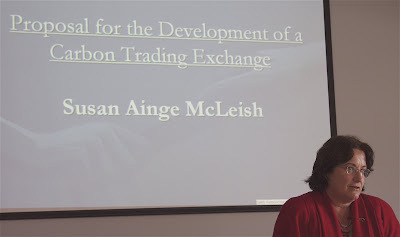 The establishment of an independent Carbon Bank and Clearing house is essential to the development of a creditable carbon trading scheme in Australia. Whilst we can applaud Rio Tinto and the like purchasing large tracts of afforested land in an attempt to assuage its emission status, these ad hoc arrangements are not to be encouraged as they avoid accounting standards. We should also avoid absolute accounting models which negate the essential nature of both energy and food production. World carbon exchanges already established in Europe and USA have made this concession. The proposal is that the market would recognise improvements in sequestration and conversely emission from a base position or industry standard and that there would be standards established and recognised for all industry types, not just fossil energy producers. If implemented in its entirety, this proposal has the propensity to find favour with all affected industry sectors. Any deviation which seeks to impose greater imposts on any sector or to extract change without concession will be met with resistance. Climate change is now generally heeded and the inclination of every industry sector is to adopt measures to reduce their impact on the environment. An independent Carbon Bank which sought to reward these measures would accumulate respect and integrity from all sectors and encourage more sustainable farming and energy sectors within our state. There are many markets, types of buyers and motives for buying carbon credits. There is the Kyoto mandatory market, the non-Kyoto mandatory market (eg. NSW, CCX), and there are the voluntary markets which are proliferating, innovating, and evolving to meet emerging needs and niches. Some form of regulation will develop, but for now, "let a million flowers bloom". An EU-style, centralised, policed, and confined system, centrally controlled may be necessary for some markets but not others. As with every market, the expectations of the buyers will determine the form of the transaction.